All of Tehran was outraged. Everywhere I went yesterday, the talk vibrated with indignation over the film 300 — a movie no one in Iran has seen but everyone seems to know about since it became a major box office surprise in the U.S. As I stood in line for a full hour to buy ajeel, a mixture of dried fruits and nuts traditional to the start of Persian new year festivities, I felt the entire queue, composed of housewives with pet dogs, teenagers, and clerks from a nearby ministry, shake with fury. I hadn't even heard of the film until that morning when a screed about it came on the radio, so I was able to nod darkly with the rest of the shoppers, savoring a moment of public accord so rare in Tehran. Everywhere else I went, from the dentist to the flower shop, Iranians buzzed with resentment at the film's depictions of Persians, adamant that the movie was secretly funded by the U.S. government to prepare Americans for going to war against Iran. "Otherwise why now, if not to turn their people against us?" demanded an elderly lady buying tuberoses. "Yes, truly it is a grave offense," I said, shaking my own bunch of irises. A poster commenting on a story about this over at Hollywood-Elsewhere brought up a good point. How many Americans really equate Persians with Iranians? 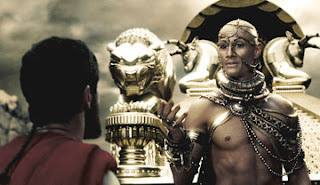 How many people sitting in the theater this weekend watching 300 thought "wow, I hate those Iranians" every time a villainous Persian appeared on screen? I can almost guarantee it was very, very few. I saw hatred for Muslims coming out of screenings of United 93 (which compounded some of the problems I had with the film), but I didn't hear a single derogatory mention of Iranians or Persians coming out of 300. Just a lot of people who were really pumped at having seen a mindlessly thrilling action film. The sad truth is, the average American just does not know that much about history, especially ancient history. If it does not immediately apply to them, then they don't know about it. Even if 300 was some anti-Iranian American propaganda piece (which it's not), the simple fact is that Americans wouldn't understand it. They don't know that Iranians are descendents of the Persians. And they probably don't know where Persia was in the first place. You say Persia they think rugs, not Iran. This isn't going to stir up anti-Iranian sentiments. And even if Americans did understand that the people who are portrayed as the villains in 300 are the ancestors of modern-day Iranians, I would hope that they would understand that this is a fictionalized account of a historic event. But you never know. I find it interesting that a film, especially one as un-political as 300, has caused such an international stir. I just hope it doesn't end up becoming a flashpoint in a conflict.